A superconductor is a material that can transport an electrical current without losing energy. Usually, this phenomenon happens at very low temperatures. The magnetic fields that superconductors expose are useful for such machines as maglev trains, proton accelerators, and MRI machines. A study led by Professor Taichi Okuda’s group, Hiroshima Synchrotron Center, revealed band and spin characteristics of new superconductor LaO0.55 F0.45BiS2. 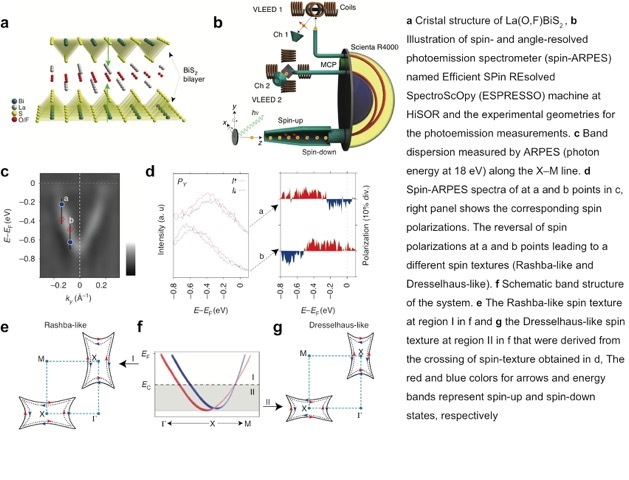 Wu and coworkers used spin-resolved photoemission spectroscopy to investigate physical properties of LaO0.55 F0.45BiS2, including its electronic band structure and spin texture. Of particular interest to the researchers was the observation of the coexistence of the Rashba-like and Dresselhaus-like spin textures in the conduction band. These results contribute further understanding of the physics of superconductors as well as the applying new spin related materials toward the field of spintronics, which has implications for developing more efficient electronic devices using spin properties of electrons.